he human resources crisis in the health sector has been gathering a ention on the global stage. To date, however, most of this a ention has focused on shortages of health human resources (HRH) at the national level. At least as important are problems at the subnational level. Massive geographic and skill mix imbalances are reflected in the perilous undersupply of HRH in most rural areas. Virtually all Sub-Saharan African countries suﬀer from significant geographic imbalances. Very li le substantive information or documentation exists on the problem. Even less is known about the lessons from policies aimed at addressing urban-rural human resource imbalances, let alone experiences of Sub-Saharan Africa countries, with such policies. There also appears to be a disconnect between the objectives and eﬀorts of policymakers on the one hand and the functioning of national health labor markets and labor market behavior on the other hand. This disconnect hinders policy eﬀectiveness and the eﬃcient utilization of resources intended to narrow urban-rural inequities. In Sub-Saharan Africa, government policies, o en limited to the management of public sector vacancies, appear to be elaborated, prescribed, and implemented independently of labor market considerations. Partly as a result, they are unable to eﬀectively address urban-rural imbalances, which are an outcome of labor market dynamics. This report discusses and analyzes labor market dynamics and outcomes (including unemployment, worker shortages, and urban-rural imbalances of categories of health workers) from a labor economics perspective. It then uses insights from this perspective as a basis for elaborating policy options that incorporate the underlying labor market forces. The goal of the study is to address undesirable outcomes (including urban-rural HRH imbalances) more eﬀectively. The study draws on an extensive inventory of policy options relevant to urban-rural labor force imbalance in Sub-Saharan Africa and the experiences with these imbalances to date. Given the limited documentation available on this topic through formal channels, the review relies heavily on “gray literature” from policymakers in Sub-Saharan Africa and their development partners, especially the World Bank and the World Health Organization (WHO). The report is divided into five main sections. The first section focuses on economic policies related to HRH objectives. It argues that policymaking has ignored health labor market dynamics. The second section provides data showing the extent of urban-rural imbalances and describes how these imbalances aﬀect health system outcomes. The third section uses a health labor market framework to explain these imbalances. The fourth section outlines policy options relevant to Sub-Saharan Africa for addressing market distortions and aﬀecting labor market outcomes. It also reviews evidence on the policies, strategies, and programs designed to address geographic imbalances in Sub-Saharan Africa, highlighting what has been done, what has worked, and what has not. The last section provides a roadmap for policymakers. What Is Wrong with the Current Policy Perspective on Urban-Rural Imbalances? olicymakers set health policy objectives (such as, for example, achieving the Millennium Development Goals for health). These health policy objectives are measured and monitored using health policy indicators. Reaching the Millennium Development Goals requires that adequate numbers of health workers be in place to serve the population in urban and rural areas. Two indicators are generally used to monitor urban-rural health worker imbalances. The main indicator is a regional health worker density indicator (the number of health workers per person). The vacancy rate of rural health worker positions is a second policy outcome indicator. Even if an adequate number of rural positions are funded, it is likely that some of them will remain vacant. Both indicators depend on the dynamics of the health labor market. Within these markets, the supply of human resources for health (HRH) (that is, the number of health workers willing to work at various compensation levels) equals the demand for HRH (that is, the number of employers able and willing to recruit health workers at various compensation levels). When labor market outcomes need to be adjusted, the government uses policy instruments to influence the supply of or demand for labor, changing the market outcome (figure 1.1). Most of these policies have failed to deliver sustained results, because they have assumed that health workers have only two alternatives: working for the government or being unemployed. Although governments in most Sub-Saharan Africa countries probably did have monopsony power until the 1980s, other employers now compete for health workers who can (legally or illegally) work in the private sector, move to other economic sectors, or emigrate. Failing to take account of the fact that governments are no longer the sole source of demand for health workers leads to flawed policies. Considering health labor market behavior helps policymakers identify (and measure) not only constraints but also opportunities for be er policymaking. Health labor markets can also help identify key success (or failure) factors for some policies. ealth Worker imbalances and regional inequities in distribution can be measured and are evident at the national and particularly the sub-national level. Several methods have been applied to capture the uneven distribution of health works. One popular method is the ratio of health workers to population, o en used to measure HRH imbalances. Other methods to analyze and compare imbalances of health workers is through economic tools such as the Concentration index, alongside the Gini index and Lorenzo Curve (see Box 2.1 and more detailed description in Annex B). Box 2.1: Overview of methods to apply to the measurement of geographical imbalances of HRH HRH to pop ratio One common HRH benchmark to measure HRH imbalances was proposed by the WHO following several studies carried out with the Joint Learning Initiative (WHO 2006). This benchmark indicates that there should be at least 2.28 health workers (doctors, nurses, and midwives) per 1,000 people to achieve the MDGs. This followed earlier pre-2006 WHO benchmarks of 0.1 doctors, 0.2 nurses, and 0.1 midwives per 1,000 people and about 0.4 health professionals per 1,000 people. Many countries have developed their own benchmarks, usually based on a standard skill mix for each type of health care facility. In Benin, for example, a district hospital is supposed have three doctors and a primary health care center is supposed to have one. Standards like these are very rigid and do not take into account the local burden of disease (especially HIV/AIDS). More sophisticated benchmarks have been designed, using clinical guidelines (see, for instance, Kurowski and others 2004). Yet, those also do not take into account the labor market determinants that may infl uence the final HRH outcome The Lorenz curve The Lorenz curve is a graphical representation of the proportionality of a distribution (the cumulative percentage of the values). To build the Lorenz curve, all the elements of a distribution must be ordered from the most important to the least important. Then, each element is plotted according to their cumulative percentage of X and Y, X being the cumulative percentage of elements and Y being their cumulative importance. For instance, out of a distribution of 10 elements (N), the first element would represent 10% of X and whatever percentage of Y it represents (this percentage must be the highest in the distribution). The second element would cumulatively represent 20% of X (its 10% plus the 10% of the first element) and its percentage of Y plus the percentage of Y of the first element. The Gini coefficient The Gini coefficient was developed to measure the degree of concentration (inequality) of a variable in a distribution of its elements. It compares the Lorenz curve of a ranked empirical distribution with the line of perfect equality. This line assumes that each element has the same contribution to the total summation of the values of a variable. The Gini coefficient ranges between 0, where there is no concentration (perfect equality), and 1 where there is total concentration (perfect inequality). The Concentration index The concentration index summarizes the information presented by the Lorenz curve. The distance between the Lorenz curve (the observed distribution of the indicator) and the “ideal distribution line” represents the degree of inequality. The number measuring the area between the two lines thus summarizes the degree to which the distribution is equitable. The concentration index formula calculates twice the area between the Lorenz curve and the line of inequality (Wagstaff 2008). It ranges in value from –1 to 1. By convention the concentration index is negative when the Lorenz curve is above the ideal distribution line (representing an undesirable indicator variable) and positive when the Lorenz curve is below the ideal distribution line (representing a desirable indicator). picture. Countries that have acceptable national level HRH to population ratios may be experiencing health worker shortages or surplus in certain geographical areas. Source: Authorâ&#x20AC;&#x2122;s calculations based on country status reports. Source: Munga and Maestad 2009.
than is suggested by their relative population levels (i.e. all concentration curves in figure 2.3 fall below the diagonal). Furthermore, rural areas tend to have a higher proportion of health workers without formal training. These health workers include community health workers, health extension workers, and traditional health workers, and are predominantly found largely in poorer, rural areas. For instance, Lesotho, where more than 75 percent of the population is rural, has 8,600 healthcare workers. Only 44 percent of them have a formal education. The other workers—4,800—are community health workers, most of whom work in rural areas. Sierra Leone is home to only 3,736 conventional workers but also to 10,723 traditional birth a endants, who are mostly found in more rural districts. Urban and rural healthcare workers also tend to have diﬀerent gender profiles, with females more heavily concentrated in urban areas than in rural areas. For instance, of all healthcare workers in Zambia, 64.7 percent are female. Nonetheless, all cadres except nurses are majority male in rural areas (see figure 2.4). All cadres have a large female contingent in urban areas. This gender imbalance further exacerbates the discussed deficits of nurses and midwives in rural areas, since these cadres are largely made up of females. Effect of urban-rural health worker imbalances on achieving health MDGs, reducing poverty, and improving health system efficiency One reason why rural ratios below benchmarks are especially troublesome is that they signal a double burden on the poorest of the poor, many of whom live in rural areas and face greater public health needs than people in urban areas (table 2.2). The most severe public health problems are o en found in rural and remote areas, where mortality levels are higher. Yet, the lack of health workers in these areas greatly decreases the likelihood that the sick obtain treatment or that the healthy prevent infection. Greater exposure to health risks and inadequate access to healthcare in rural areas reduce the likelihood of achieving the MDGs, which depend on the expansion of coverage of key, high-impact interventions. It is diﬃcult for rural areas without adequate access to the providers of these interventions to achieve the MDGs. A case-in-point is maternal mortality. Strong evidence points to a high coverage rate of skilled birth a endants as a critical input for reducing maternal mortality rates (Anand and Baernighausen 2004). The lack of specific professionals, such as midwives, in rural areas is strongly associated with the failure to achieve the maternal mortality MDG. Source: Ministério do Plano e Finanças 2000. A frequent contention is that higher-level professionals (for example, doctors) are not in demand in rural areas. And that the urban-rural imbalance of higher-level professionals may actually reflect this apparent lack of demand for them. Community and traditional health providers may be more trusted and respected than formal health workers in some remote areas and, thus, considered a more appropriate solution. Furthering this argument is the apparently diﬀerent utilization pa ern of higher-level professional health workers by rural populations. When doctors are made more accessible in rural areas, however, the utilization pa ern is not significantly diﬀerent from that of the non-poor (Ouendo 2005). Many demographic and health surveys find that the poor have lower overall utilization rates of health workers, but when they do seek out health services, they choose the same combination of services and health professionals as do the non-poor. Thus, the apparent lower utilization of higher-level health workers may reflect the poor’s limited access to higher-level and qualified health workers rather than diﬀerent preferences (for Tanzania, see Leonard, Mliga, and Haile Mariam 2003; Klemick 2007). Urban-rural imbalances in health workers hinder the development of primary health care services, reducing the eﬃciency of the health system. Using urban referral centers rather than rural centers dramatically increases the costs of health care services for the poor for two main reasons. First, rural people incur costs in traveling to an urban area.1 Second, when they reach their destination, they pay more for health care services, because urban health care services are usually more expensive than rural services. Sanders and others (1998) show that for the same medical case (that is, acute malaria fever), the length of stay and number of lab tests may be 10 times as great in an urban area than in a rural one. This cost includes both the direct cost for transportation and the opportunity cost of taking a halfday or a day oﬀ. 2 A cadre that commonly has a skill set somewhere between that of doctors and that of nurses. urban health labor markets. The diﬀerences in demand and supply, as well as compensation in rural versus urban areas, are discussed in the remainder of this chapter. Urban-rural differences in demand for labor Evidence shows that demand for HRH is lower in rural areas than in urban ones. This means that, all other things equal, at any given compensation level, rural employers will employ fewer healthcare workers than their urban counterparts. One of the reasons for this situation is, that because of low employer income and limited progress in fiscal decentralization in many Sub-Saharan Africa countries, rural health facilities are struggling to receive adequate funding. In Benin, for example, less than 40 percent of regional credits allocated for rural health centers actually reached them; the balance remained at regional levels (World Bank 2003). Disproportionate allocation of public funds to district health authorities has also been observed in Zambia. This fiscal centralization, coupled with the abolishment of user fees in several countries, has limited the income of local health facilities and decreased their ability to hire healthcare workers. Such limitations on rural health facilities’ budgets means that the demand curve, representing the number of HRH that employers want and can aﬀord, is farther to the le in rural markets than in urban markets. HRH funding shortages in rural areas are probably significant factors explaining urban-rural imbalances. supply curve may be slightly to the le of the urban supply curve, especially for health workers that are less sensitive to compensation levels. There is some evidence that lower-level professionals are more amenable to working in rural areas than higher-level professionals. A study in Ghana finds that some lower-level professionals appreciate the exposure to a wide range of pathologies that comes with rural service. The reasons cited for preferring rural areas include the fact that they are given duties above their skill level; bond more tightly with staﬀ, facilitate on-the-job learning skills (such as surgery); have more opportunities to manage teams, allowing them to develop management and leadership skills; and have higher social recognition in villages (they are sometimes called doctor) and receive gi s (Lievens and others 2007). Evidence also suggests that younger health workers may be more willing to work in rural areas than older workers. A study in Ethiopia tracking the graduating nursing class of 2004 finds that 34 percent of graduating nurses were willing to accept a rural placement in 2004; by 2007, this proportion had declined to 18 percent (Serneels et al. 2005). In Niger, young doctors cite lack of opportunities for postgraduate training as a key reason for not accepting rural positions (Souleymane et al. 2005). In contrast, older doctors cite weak remuneration as their main reason for not considering rural positions. Older doctors face a higher opportunity cost for moving to rural areas, as the reputation they have built in the city o en allows them to run a private practice. Anecdotal evidence from Benin and Niger indicates that doctors can more than double their salary by accepting private clients a er hours. Given that moonlighting can make up a significant proportion of doctors’ incomes, moving to a rural area may indeed represent a considerable income decrease. Evidence also points to a gender diﬀerence in willingness to work in rural areas, with men more willing to do so than women. Dussault and others (2006) suggest that female doctors are likely to live near their husband’s place of employment. In the Republic of Congo, as in many Sub-Saharan Africa countries, married couples are required by law to live together; providers assigned to rural areas, therefore, o en marry and move to the city to be with their spouses (Crigler, Boniface, and Shannon 2008). There is anecdotal evidence that once a woman is assigned to a rural job, she tries to get married quickly in order to move back to the capital. For nonnative women without family or friends in the region, locating to a rural area without support or protections can also create safety concerns. A 2008 HRH assessment of the Republic of Congo finds that “rural se ings are also considered too dangerous for unaccompanied women, as they cannot ride buses by themselves or feel comfortable leaving their homes to work in the villages at night if needed. As more than 61 percent of health workers are women, this further complicates staﬃng rural regions” (Crigler, Boniface, and Shannon 2008). The fact that many female healthcare professionals come from more educated, elite, or urban backgrounds also makes them less likely to accept positions in rural or remote areas. Evidence shows that health workers with rural or poor backgrounds are o en more willing to work in rural areas than those from urban or wealthier backgrounds. Data from Ethiopia indicates that health workers from rural areas or less well-oﬀ backgrounds are more motivated and willing to work in rural areas (Serneels et al. 2008). Some of the willingness of lower level or alternative professionals may stem from the fact that a greater proportion of such people have rural backgrounds.2 Some health workers may be willing to work in rural areas for altruistic reasons. Among both nursing and medical students in Ethiopia, the most frequently cited reason for seeking a rural placement is “to provide healthcare where it is needed most” (this reason was cited more o en by nursing students than by medical students; Serneels et al. 2005)—see figure 3.2. At the same time a follow-up cohort study three years later finds that altruism diminishes once workers gain experience and begin working as healthcare professionals (Serneels et al. 2008). heavy workloads are only some of the factors disproportionately evident in rural facilities. A study of the Republic of Congo finds that “this [urban-rural] imbalance has many causes, not the least [of which] is the diﬃcult working conditions providers encounter in rural areas, such as lack of infrastructure, roads, electricity, water, and housing” (Crigler, Boniface, and Shannon 2008). Opportunities for education and jobs for spouses are also limited, increasing the costs of living in a rural area. Workers who transfer to rural areas also may have to rent a house in the city for their children who remain there. This low demand will depend on the employment arrangement in place in rural areas. This phenomenon will, of course, be present in decentralized systems, where rural health care facilities can directly recruit and pay some of their staﬀ but have diﬃculties doing so because of limited (or delayed) budget and revenues. Conversely, in countries where recruitment and payment of salaries are still fully centralized, there is no public rural employer as such. 2 A large body of evidence indicates that professionals from rural area are more likely than professionals from urban areas to se le in remote areas (see Rolfe and others 1995; Dunbabin and Levi 2003; Vries and Reid 2003). Easterbrook and others (1999) find that Canadian physicians who were raised in rural communities were 2.3 times more likely than those from non-rural communities to choose to practice in a rural community immediately a er graduation. number of policies and interventions are available to policy makers to impact labor market dynamics and reduce geographical imbalances of health workers (table 4.1). This chapter focuses on the supply side policy options to address rural/urban imbalances and includes a review of the experience of countries with policies and their impact on the rural/urban distribution of health workers in countries in SSA. For each policy category except increasing demand for health workers in rural areas— a detailed discussion of which is beyond the scope of this study—it reviews theoretical insights and the evidence of success and failure, including key factors for explaining possible impacts. The chapter shows that many SSA have a empted to correct the rural urban imbalance - some with success-, by directly influencing key labor market dynamics. Increasing health worker demand Although demand side policy options are not discussed in detail here, they do warrant a brief mention. A first approach to strengthening the demand for health workers in rural areas is to increase the funding going to rural districts and facilities. This is increasingly done throughout SSA as more and more countries adopt and implement fiscal decentralization. Depending on the model adopted, funding for rural health workers wages is transferred to local governments in the form of block grants –as in Ethiopia and temporarily in Zambia- or earmarked transfers –as in Benin, Uganda and Mali -. In other countries funding for wages is directly transferred to facilities as in Rwanda. When the funds transferred are calculated in function of needs and poverty –needs based or equity formula- this contributes further to increasing demand for rural workers. (see Vujicic et al). A further and more extensive discussion of country experience with increasing demand in rural areas and information on some of the key successes and failures with doing so is beyond the scope of this study and will have to be addressed in future research. Box 4.1 Using discrete choice experiments to elicit health workersâ&#x20AC;&#x2122; preferences regarding rural jobs Stated preference methodologies include conjoint analysis, contingent valuation, and other techniques for assessing the utility of alternatives for individuals. These increasingly popular methodologies have been used in several countries, including Ethiopia, Indonesia, Malawi, and Niger, to elicit health workersâ&#x20AC;&#x2122; preferences regarding rural jobs In a discrete choice experiment, a sample of health workers is asked to choose between simple job descriptions, usually arranged in about 15 pairs (box table). Collected observations are then analyzed using econometric models. Figure 4.1 was produced through such a process. The lack of success has generally been a ributed to the level of monetary and nonmonetary incentive, which was insuﬃcient to outweigh the opportunity costs associated with se ling in rural areas. At a minimum, monetary incentives should oﬀset the loss of private practice revenues (which are more diﬃcult to generate in rural areas); the added cost of children’s education (as children usually live in the capital city, which entails transportation and lodging costs); and the loss of the spouse’s salary. Few programs analyzed these opportunity costs before se ing the level of financial incentive, thus greatly increasing the chances of failure. Younger doctors, who are usually unmarried, have no children, and lack enough experience to a ract private clients, may face lower opportunity costs. They also highly value opportunities for learning, including clinical mentoring and preferred access to postgraduate training. Such nonmonetary incentives have not been included in most incentive packages. More research is needed to evaluate the outcomes of incentive programs on rural shortages. The best policies may well be those that successfully combine monetary and nonmonetary incentives. Most incentive programs have targeted only doctors; li le is known about their eﬀect on other types of health workers. In situations where health workers are unresponsive to both monetary and nonmonetary incentives, other solutions (such as compulsory placement) may have to be considered. Where incentives succeeded, their success was generally a ributed to the fact that the incentive packages comprehensively addressed the needs and opportunity costs of doctors. In Mali, the needs and constraints of the targeted group of doctors were well researched and understood. In Zambia, the incentive package was not only financially a ractive, it also took into account all the various opportunity costs faced by rural staﬀ (technical support, children’s education, housing, transportation, and so forth) and included nonmonetary incentives for expanding learning opportunities for young doctors. In both cases, preparatory analysis was conducted to evaluate the specific types of incentives needed to motivate specific subgroups of health workers before the programs were put into place. Neither country used sophisticated techniques for eliciting health workers’ preferences. Instead, they adjusted their policy through a long process of trial and error. Other countries could avoid this costly and lengthy process by using state-of-the-art techniques, such as discrete choice experiment. Success is also related to some contextual factors, notably the dynamics between urban and rural labor markets. A racting health workers to rural areas is easier when there is unemployment in urban labor markets—this factor may explain part of the success of the Malian experience. Because of fiscal constraints, the Malian government is able to hire only a small proportion of new medical graduates. As a consequence, there is a large pool of unemployed doctors in the capital city, Bamako. These underemployed doctors were explicitly targeted by the incentive program; many of them reacted favorably to the proposal to set up a private practice in a rural area. Another contextual factor is the degree of decentralization in a given country. The Malian experience could not have been successful without the high degree of decentralization already achieved in the country. Local communities in Mali have substantial experience managing and outsourcing local services. Contracting private doctors was, thus, not a major challenge for these communities. Another possible issue relates to civil service regulation of compensation. In many SubSaharan African countries, governments are still the main employer of health workers, whose remuneration is usually defined by national and multisectorial salary scales. Ministries of finance are leery of rural incentives for health workers, fearing the risk of spillover eﬀects. In Niger, for instance, as soon as the government agreed to implement incentives for doctors, other health workers asked for (and obtained) similar advantages. Spillover can also extend beyond the health sector, especially to education, as teachers share health workers’ reluctance to work in rural areas. Several countries are trying to overcome this constraint by creating health worker categories outside the civil service system (delinkage). Evidence on this policy is mixed, with successes in Rwanda and failures in Benin and Zambia. Failure can also be a ributed to the lack of support of key stakeholder groups, associations, and health workers themselves. Doctors in Zimbabwe, for example, went on strike in response to compulsory placement policies requiring medical students to work two years in rural stations (Mutizwa-Mangiza 1998). Increasing the overall supply of health workers by scaling up HRH education Increasing the overall supply of health workers does not target urban-rural imbalances as such, and is thus not discussed in detail here. At the same time it warrants mention since what is sometimes referred to as “flooding the market,” may by default lead to an increase of health workers in rural areas. In principal, the more health workers there are at the aggregate level, the larger the number willing to work in rural areas. To scale up the number of health workers, the physical, technical and organizational capacity of health training institutions must o en be scaled up as well. And exploring innovative approaches to maximize existing production resources and learning from country experiences with increasing production output of HRH is also important. Furthermore, to secure an increase in the number of health workers in rural areas through flooding, labor market demand for HRH in rural areas may also have to be increased. If rural employers do not hold the required decision making and financial capacity, the increased supply may not be adequately absorbed in rural areas. On the whole thus, increasing the overall supply of health workers does not target rural-urban imbalances as such, but may be a policy option at least worth exploring as a requirement before designing other policies for addressing urban-rural imbalances. Admissions policies giving preference to or allo ing a specific number of slots to applicants from rural regions Creation of regional rural medical and nursing schools Development of curricula with strong emphases on family or community medicine Compulsory rural internships Financial aid and scholarships for rural students Mentoring by experienced rural doctors for new health workers in rural areas. Results from the most in-depth study of a rural pipeline program (Rabinowitz and others 2001) find that a preferred admissions policy and a revised curriculum are the most relevant factors in a racting rural students and influencing their decision to later se le in rural areas of Pennsylvania, in the United States. Rural internships and financial aid had li le impact on student decisions. Adequate training, monitoring, and support are key success factors of any alternative skill mix policy. Although concerns have been raised about the safety of services provided by lower and midlevel health workers, most of the evidence shows that, with appropriate training and support, such health workers can respond eﬀectively to most emergency problems in general surgery and obstetrics. There is li le empirical evidence of precisely how much support, monitoring, and supervision are required in alternative skill mix schemes. Some observers argue that the new task distribution must be institutionalized in order for the programs to be sustained or expanded. If, for example, nurses are given the task of managing antiretroviral therapy, as in Botswana, their new position should be clearly defined so that there is no ambiguity, and their performance should be closely monitored (Miles and others 2007). Some observers argue that an alternative skill mix initiative that permits treatment where people otherwise would get none at all should be viewed positively (Philips, Zachariah, and Venis 2008). The overall, but limited, picture from studies to date indicates that alternative skill mix is a viable option to provide support to the overstretched healthcare systems in many African countries; although, it cannot complete solve the region’s human resources problem. Another factor in determining the success of alternative skill mix initiatives is the choice of which professionals take on which tasks. Two considerations are crucial: the professional must be able to take on the additional workload, and the professional should be considered appropriate to taking on the task in view of the local community’s features and potential clients. The first consideration demands that the current workload and potential for its increase be analyzed before deciding if an individual is able to take on the new task. In Lesotho, a focus group study found that many people with HIV/AIDS had had unsatisfactory experiences with nursing staﬀ, which aﬀected their willingness to receive treatment (Pa erson and others 2007). The participants in the study acknowledged that these experiences had occurred largely because the nurses were overworked and underpaid. The participants stated that they would be happy with nurses taking on additional tasks, such as prescribing antiretroviral treatment, as long as they received adequate clinical training and anti-stigma training. The clients’ perceived view of the nurses’ a itudes underscores the second consideration: the importance of taking account of local social factors when assigning roles to specific workers. In some communities, women may prefer to receive treatment from women. Goodman and others (2006) raise the idea that, for simple public health interventions, tasks may even be shi ed to nonmedical professionals. Their study finds that a program that trained shopkeepers in Kenya to treat childhood fevers was both cost-eﬀective and sustainable. These findings are consistent with those of other studies on the cost-eﬀectiveness of alternative skill mix for the delivery of health services in both high-income and resourceconstrained countries. Much of that evidence is from high-income countries; however, more work needs to be done to develop a clearer picture of these experiences in Sub-Saharan Africa. More studies are needed on the performance of lower-level professionals recently trained in higher-level interventions. for organizing extended stays of Cuban health workers in rural areas. Figure 4.3 shows that the number of Cuban doctors presently employed in Ghana has grown steadily since 1982, and today hovers around the 200 mark. Very li le is known on the impact of these contracts (Dussault and others 2006); however, Ghana emphasizes the commitment and dedication, as well as low cost, of Cuban health workers. Other countries hire immigrant health workers on a case-by-case basis. An advantage that immigration policies have over education is their time frame. Immigration polices allow a much quicker response to national shortages than education policies, at least for most categories of health workers. In Mali, more than 100 doctors agreed to start private practices in rural areas (Coulibaly and others 2007). Under the South African Rural Allowance and Scarce Skills Allowance, 28–35 percent of rural health workers who received the 8–22 percent salary bonus believed it aﬀected their career plans for the following year (Vujicic and Lindelow forthcoming). The Zambian Health Workers Retention Scheme a racted and retained more than 50 doctors in rural areas in less than two years (Koot and Martineau 2005). 2 Zambia’s compulsory one-year placement of young doctors in rural areas was not strictly enforced; when it was, many doctors resigned rather than work in rural areas (Koot and Martineau 2005). One exception to enforcement failure can be found outside the African region: Thailand was successful in enforcing a comprehensive package of benefits and incentives for rural health workers as well as a rural pipeline program (Wibulpolprasert and others 2003b). 3 In Nepal, a nationwide health worker surplus was intentionally created to overwhelm health labor markets. The underlying assumption was that such a policy would entail high unemployment in urban areas, which would create a natural incentive for health workers to move in rural areas. Evidence on results is scarce and, in most cases, disappointing. STEP 1 Is there a funding shortage in rural areas ? 2. Incentives (monetary and/or non monetary) STEP 2 Is there a HW surplus on the urban labor market ? rural demand for health workers, must be prioritized. This can be done through increased resources from governments as well as from users. Fiscal decentralization helps increase public resources for peripheral providers whether channeled directly to providers and combined with providers’ autonomy or as subsidies to demand side financing, including health insurance or cash transfers. Private resources can also be used more eﬃciently, for example, by pooling user payments into rural health insurance mechanisms that can contribute to increased utilization and, thus, resources for rural providers. The second step is to address health workers’ willingness to work in rural areas. Choosing the right policy mix strongly depends on the labor market situation. Incentive and bonding policies are likely to be more eﬀective if there is a surplus of health workers on the urban market and a pool of unemployed or underemployed health workers to draw from in urban areas. Consequently, an analysis of labor supply, rural and urban, is highly recommended before selecting the mix of policy options. (Appendix D provides a brief presentation of such an analysis.) If health workers are available and underemployed and incentives or bonding policies emerge as promising options, policymakers must carefully estimate the opportunity costs associated with rural jobs. Many countries carry out feasibility studies in a very traditional way (that is, by administering a simple questionnaire). Stated preferences techniques (especially discrete choice experiment) are not more expensive and provide much more insight than traditional surveys. They should be carried out systematically before designing the package to a ract health workers to rural areas. If there is no health worker surplus on the urban labor market, incentives and bonding is unlikely to work. In this case, education and alternative skill mix policies are probably the best solutions. Rural pipelines are o en needed to serve particularly remote and poor areas. Evidence from industrial countries suggests that this set of policies can have a strong impact. However, when alternative skill mix is implemented through in-service training, these policies are longer-term options. Creating midlevel professionals, such as medical or clinical oﬃcers, for example, requires waiting three or four years before the first class graduates. As health workers will live in the system for many years, this also has long-term consequences on the type of health system that is developed. Most policy options can be combined, especially to take into account the fact that some are short-term and others longer-term solutions. Niger started to prepare its policy in 2004–05, when it decided to scale up the production of surgeons. Given that the first class would not graduate until 2008, two additional (short-term) policies were implemented: an incentive scheme for doctors and fast-track (one year) training in district surgery for a group of general practitioners. In Ethiopia, the recent scaling up eﬀorts supports a combination of short-term solutions. The rapid training of 30,000 health extension workers trained in one year is associated with the increase in production of medical oﬃcers trained in four years as well as the creation of new medical schools in rural areas. Policy options can be evaluated on the basis of two criteria: ease of implementation and potential impact (table 5.1). Because country-specific conditions o en dictate how policies work in practice, learning by doing is the best approach. Learning from experience requires the regular evaluation of the impact of implemented policies. Evidence on policy impact remains very limited in Sub-Saharan Africa. Enhancing data collection and analysis is a key priority for improving the geographical distribution of health workers within the region’s countries. Limited evidence; can have significant impact if opportunity costs and preferences associated with rural jobs are correctly measured and there is health worker surplus in urban markets. No success story in Africa, probably because of weak capacity for enforcement. Evidence lacking; impact on rural shortage possible if funding shortage is large and addressed at same time. Because of cohort effects, impact appears slowly. Evidence on success limited, but potential impact is probably strong, given experiences in industrial countries. Evidence on impact compelling; can emerge quickly if alternative skill mix is created through in-service training. No evidence available; impact probably small. conomists use a variety of indicators to measure the concentration or equitable distribution of resources, including the Gini coeďŹ&#x192;cient, the concentration index, and the Lorenz curve. All three measures are used to measure equity, concentration, and the adequacy of targeted policy interventions. example, income). It shows the proportion of the distribution of a variable associated with the bo om X percent of values over which it is distributed (for example, population) (figure B.1). The equal distribution is represented by a diagonal line. On this line, 20 percent of the population receives 20 percent of income, 40 percent of the population receives 40 percent of the income, and so forth. This line represents the most equitable distribution of income across population. The more the Lorenz curve deviates from this line, the greater the inequity. The Lorenz curve can be below or above the diagonal, depending on the variable. When the variable is valuable to the population—as, for example, in the case of income, expenditure on health or education, access to health services or to water—the curve is below the diagonal line. When the variable is detrimental to the population, as in the case of accidents, injuries, or deaths, the curve falls above the diagonal line. The Concentration index The concentration index summarizes the information presented by the Lorenz curve. The distance between the Lorenz curve (the observed distribution of the indicator) and the “ideal distribution line” represents the degree of inequality. The number measuring the area between the two lines thus summarizes the degree to which the distribution is equitable. The concentration index formula calculates twice the area between the Lorenz curve and the line of inequality. It ranges in value from –1 to 1. By convention, the concentration index is negative when the Lorenz curve is above the ideal distribution line (representing an undesirable indicator variable) and positive when the Lorenz curve is below the ideal distribution line (representing a desirable indicator). a plausible assumption for policy design and analysis, arguing that wages are not sticky forever. In the health sector, the labor market is the economic space in which health workers sell their skilled labor and employers buy skilled labor. This market is made up of the supply of health workers (the number of health workers willing to work at various compensation levels) and the demand for health workers (the number of workers employers are willing and able to hire at various compensation levels). The interplay between supply and demand should determine the compensation level within a labor market. Compensation is a multidimensional concept that takes into account many monetary and nonmonetary factors. Monetary compensation may be direct or indirect. Direct financial or monetary compensation is paid as a wage or salary, a financial bonus (for good performance or as an incentive to serve in a rural area), or as part of a supplementary income scheme. Indirect financial compensation oﬀers goods and services that would otherwise have to be paid for. Examples include scholarships and loan repayments, childcare, housing, cars and motorcycles, health insurance, and education. Nonfinancial compensation refers to benefits that could not be paid for but are nonetheless considered valuable. Such compensation can be related to career (on-the-job training, experience, professional development opportunities, job security, career advising, networking); the working environment (availability of supplies, equipment, technology, be er infrastructure, reduced workload, a flexible schedule); or lifestyle and family life (vacation time, opportunities for spousal employment). Keeping in mind these many forms of compensation is vital when reviewing policy options. Compensation refers to net compensation—the diﬀerence between the gross (monetary plus nonmonetary) compensation and the costs associated with a particular job that are borne by the employed individual. For example, doctors in rural areas may bear additional monetary and nonmonetary costs—such as having to pay for children’s private schooling (because rural public schools are of a lower quality than urban schools) or having to pay both their own rural housing and urban housing for children who remain in the city to study; forgone opportunities for professional development; and forgone amenities available only in urban areas and proximity to family in the city. Net compensation compares costs and benefits, creating a more accurate picture of the choices facing health workers. Economists argue that the supply side of the health labor market is determined by the number of health workers available (the health labor force) and their willingness to work at various compensation levels. Because many workers are willing to work at a high compensation levels and few are willing to work at low compensation levels, the market supply curve is always upward sloping. The demand for health labor is determined by the number and the size of employers and their willingness to hire health workers at various compensation levels. Because employers hire only a few workers at a high compensation level but many workers at a low compensation level, the demand curve is always downward sloping (demand in the economic sense is distinct from demand in the social welfare sense, where it refers to the number or healthcare workers needed to address all health care concerns). Demand is determined by the desire, ability, and willingness of employers to pay for providers of health-related services. Healthcare that is desired but cannot be paid for is not considered part of demand and does not aﬀect the health labor market. Market-clearing equilibrium, unemployment, and labor shortages The classical labor market model assumes that all markets ultimately clear. Key assumptions underlying this model are that compensation levels are allowed to fluctuate (for example, they are not fixed by the government or trade unions); that people are free to work or not; and that accurate information is available to both employers and workers about labor market conditions. Failure to meet these conditions must be taken into account in cra ing policy. usually in one of three diďŹ&#x20AC;erent situations: urban unemployment equals rural shortage (figure C.4), urban unemployment is greater than rural shortage, or urban unemployment is less than rural shortage. Market distortions of all kinds can cause markets to fail to clear. An urban surplus of health workers may not equilibrate in the long run with a rural deficit of health workers because of market imperfections, such as lack of information. In practice, most urban workers remain uninformed about compensation and vacancies in rural areas, making them less likely to move there. A more eďŹ&#x20AC;ective system to communicate information regarding vacancies would increase the rural supply of labor. Increased information translates into an outward shi in the rural supply curve, along with an inward shi in the urban supply curve, which would increase the rural labor force and employment while decreasing urban unemployment (figure C.5). Dussault, G. 2006. “Not Enough There, Too Many Here: Understanding Geographical Imbalances in the Distribution of the Health Workforce.” Human Resources for Health 4: 12. Easterbrook, Mark. 1999. “Rural background and clinical rural rotations during medical training: eﬀect on practice location.” Canadian Medical Association Journal 160: 1159–63. Ferrinho, Paolo. 2007. “Human Resources Function in the Health Sector in GuineaBissau.” Fileds, Gary, and Mabel Andalón. 2008. “A Toolkit for Analyzing Labor Markets in the Health Care Sector in Africa.” January. Freedman, L. P. 2002. “Shi ing Visions: “Delegation” Policies and the Building of a ‘RightsBased’ Approach to Maternal Mortality.” Journal of the American Medical Women’s Association 54 (3): 154–58. Fryer, George. 2002. “The Association of Title VII Funding to Departments of Family Medicine with Choice of Physician Specialty and Practice Location.” Family Medicine 34 (6): 436–40 Furth, R. 2006. “Zambia Performance-Based Incentives Pilot Study.” Initiatives Inc. and USAID. Gimbel-Sherr, Sarah. 2007. “Using Nurses to Identify HAART Eligible Patients in the Republic of Mozambique: Results of a Time Series Analysis.” Human Resources for Health 5: 7. Goodman, Catherine. 2006. “The Cost-Eﬀectiveness of Improving Malaria Home Management: Shopkeeper Training in Rural Kenya.” Health Policy and Planning 21 (4): 275–88. Herbst, C., and D. Gĳsbre ts. 2007. Comprehensive and Accurate Information on Health Worker Stock, Profiles and Distribution in Zambia: Analysis of the JICA Data. Dra report. Hounye, F. 2007. Mécanismes incitatifs a l’exercice du personnel de santé en zone déshéritées et/ou enclavées. January, final report, Ministry of Health, . Hsueh, Wayne. 2004. “What Evidence-Based Undergraduate Interventions Promote Rural Health?” New Zealand Medical Journal 117 (1204). Ivers, Louise. 2008. “Task-Shi ing in Delivery of HIV Care.” December. Jack, William. 2008. Human Resources for Health in Ethiopia. Summary Report, February. Kakwani Nanak, Adam Wagstaﬀ, and Eddy Van Doorslaeﬀ. 1997. “Socioeconomic Inequalities in Health: Measurement, Computation, and Statistical Inference.” Journal of Econometrics 77 (1): 87–103. Klemick Heather. 2007. “Doctor Quality, Roads and Patient Access to Health Care in Rural Tanzania.” Working paper, University of Maryland. Koot, J., and T. Martineau. 2005. Mid-Term Review of the Zambian Health Workers Retention Scheme. ZHWRS) 2003–2004. Koot J., V. Mukonka, J. Oosterhoﬀ, and C. Simutowe. 2003. Supplementation Programme Dutch Medical Doctors 1978–2003: Lessons Learned and Retention Scheme Zambian Medical Doctors 2003–2006. Kotzee, T., and I. D. Couper. 2006. “What Interventions Do South African Qualified Doctors Think Will Retain Them in Rural Hospitals of the Limpopo Province of South Africa?” Rural and Remote Health 6: 581. Kruk, M. 2007. “Economic Evaluation of Surgically Trained Assistant Medical Oﬃcers in Performing Major Obstetric Surgery in Mozambique.” British Journal of Obstetrics and Gynecology 114: 1253–60. Kurowski, Christoph, Kaspar Wyss, Salim Abdulla, and Anne Mills. 2004. “Human Resources for Health: Requirements and Availability in the Context of Scaling-Up Priority Interventions in Low-Income Countries. Case Studies from Tanzania and Chad.” HEFP Working Paper 01/04, Health Economics and Financing Programme, Department of Public Health and Policy, London School of Hygiene and Tropical Medicine. Lee, S., and L. Mackenzie. 2003. “Starting Out in Rural New South Wales: The Experiences of New Graduate Occupational Therapists.” Australian Journal of Rural Health 11: 36-43. Lehmann, Utah. 2008. “Staﬃng Remote Rural Areas in Middle and Low-Income Countries: A Literature Review of A raction and Retention.” BMC Health Services Research 8: 19. Lemiere Christophe. 2008. “The Benin Health Workforce: A Labor Market Analysis.” Leonard, Kenneth, G. R. Mliga, and D. Haile Mariam. 2003. “Bypassing Health Centers in Tanzania: Revealed Preferences for Quality.” Journal of African economies 11 (4): 441–71. Lin, Y., and L. M. Franco. 2000. Assessing Malaria Treatment and Control at Peer Facilities in Malawi. Quality Assurance Project: Case Study. U.S. Agency for International Development. (USAID) by the Quality Assurance Project (QAP) Bethesda, MD. Lievens, Tomas. 2007. Ghana Health Worker Study. Loukou, Dia. 2006. “Recensement du personnel médical au chômage en Côte d’Ivoire.” November. Maestad, O. 2006. Human Resources for Health in Tanzania: Challenges, Policy Options and Knowledge Gaps. CMI Report Mangham, Lindsay. 2007. “Addressing the Human Resource Crisis in Malawi’s Health Sector: Employment Preferences of Public Sector Registered Nurses.” ESAU Working Paper 18, Overseas Development Institute, London. Mbaruku, G. , and S Bergström. 1995. “Reducing Maternal Mortality in Kigoma, Tanzania.” Health Policy and Planning 10 (1): 71–8. Mengistu, Samuel. 2008. “Task Shi ing in HIV Counseling and Testing: Experience from Ethiopia.” January 22, JHPIEGO/Ethiopia, Merkle, Ricarda, and Helen Prytherch. 2007. “Initiatives Addressing Human Resource for Health in the United Republic of Tanzania.” Bulletin von Medicus Mundi Schweiz 104 (May). Miles, K. 2007. “Antiretroviral Treatment Roll-Out in a Resource-Constrained Se ing: Capitalizing on Nursing Resources in Botswana.” WHO Bulletin 85: 557. Miti, S. K. 2006. “Migration, Retention and Return of Health Professionals. The Zambian Case. The Challenge of Managing a Health Care System in Crisis.” Presentation at the Health in Foreign Policy Forum. Mullan, F. and S. Frehywot. 2007. “Non-Physician Clinicians in 47 sub-Saharan African Countries.” Lancet 370 (9605): 2158–63. Munga, A Michael, and Masetad, O ar. 2009. Measuring inequalities in the distribution of health workers: The case of Tanzania. Human Resources for Health, 2009, 7:4. Murray, Richard, and Ian Wronski. 2006. “When the Tide Goes Out: Health Workforce in Rural, Remote and Indigenous Communities.” Medical Journal of Australia 185 (1): 37–38. Pa erson, Jacqueline. 2007. “Building Healthy Communities: The Views of People Living with HIV in ‘Task Shi ing’ and Health Systems Strengthening. Findings from a FiveCountry Consultation.” Health Global Access project, November 26. Pereira, C. 1996. “A Comparative Study of Caesarean Deliveries By Assistant Medical Oﬃcers and Obstetricians in Mozambique.” British Journal of Obstetrics and Gynecology 103 (6): 508–12. Pereira, C., A. Cumbi, R. Malalane, F. Vaz, C. McCord, A. Bacci, and S. Bergström. 2007. “Meeting the Need for Emergency Obstetric Care in Mozambique: Work Performance and Histories of Medical Doctors and Assistant Medical Oﬃcers Trained for Surgery.” British Journal of Obstetrics and Gynecology. Philips, M., R. Zachariah, and S. Venis. 2008. “Task Shi ing for Antiretroviral Treatment Delivery in Sub Saharan Africa: Not a Panacea.” Lancet 371 (9613): 682–84. Picazo, Oscar. 2008. “Struggling and Coping to Serve: The Zambian Health Workforce as Depicted in the Public Expenditure Tracking and Quality of Service Delivery Survey, 2006.” World Bank, Africa Region, Human Development 1, Country Department 2, Washington, DC. Playford, D., A. Larson, and B. Wheatland. 2006. “Going Country: Rural Student Placement Factors Associated with Future Rural Employment in Nursing and Allied Health.” Australian Journal of Rural Health 14 (1): 14–19. Rabinowitz, Howard. 1999. “A Program to Increase the Number of Family Physicians in Rural and Underserved Areas: Impact a er 22 years.” Journal of the American Medical Association 281 (3): 255–60. Rabinowitz, Howard. 2001. “Critical Factors for Designing Programs to Increase the Supply and the Retention of Rural Primary Care Physicians.” Journal of the American Medical Association 286 (9). Reid, S. 2004. Monitoring the Eﬀect of the New Rural Allowance for Health Professionals. Health Systems Trust, Durban, South Africa. Rolfe, I. E., S. A. Pearson, D. L. O’Connell, and J. Dickinson. 1995. “Finding Solutions to the Rural Doctor Shortage: the Rules of Selective Versus Undergraduates Medical Education at Newcastle.” Australia and New Zealand Journal of Medicine 5: 512–7. Sanders, D. J. , S. Kravitz, S. Lewin, and M. McKee. 1998. “Zimbabwe’s Hospital Referral System: Does It Work?” Health Policy and Planning 13 (4): 359–70. Serneels, Peter. 2005. “For Public Service or Money: Understanding Geographical Imbalances in the Health Workforce.” World Bank Policy Research Working Paper 3686, Washington, DC. Serneels, Peter. 2008. Discovering the Real World: Health Workers’ Early Work Experience and Career Choice. Souleymane. 2005. Etude sur la motivation des personnels de santé à servir en périphérie in Niger. July. Souleymane. 2008. “Impact des mesures d’incitation financière accordées aux médecins, pharmaciens et chirurgiens dentists in Niger.” Impact of Financial Incentives for Doctors, Pharmacists and Dentists in Niger July. Sy, Aly, and Mohamed Hamed. 2006. “Etude sur les primes de zone et de technicité.” Ministry of Health and World Bank. Thairu, A., and K. S midt. 2003. “Training and Authorizing Mid-Level Providers in Life-Saving Skills in Kenya.” In Sandra Crump, ed., Shaping Policy for Maternal and Newborn Health: A Compendium of Case Studies. Baltimore, MD: JHPIEGO. Van Dormael, Monique. 1997. “La médecine coloniale, ou la tradition exogène de la médicine moderne dans le Tiers Monde.” Studies in Health Services Organisation & Policy 1. Vaz, F. , S. Bergström, M. Vaz, J. Langa, and A. Bugalho. 1999. “Training Medical Assistants for Surgery. Policy and Practice.” Bulletin of the World Health Organization 77(8): 688– 91. Vries, Elma De, and Steve Reid. 2003. “Do South African Rural Origin Medical Students Return to Rural Practice?” Health System Trust Paper, May. Vujicic, Marko, and Magnus Lindelow. Forthcoming. Approaches to Reduce Health Worker Shortages in Remote Areas: A Global Review of Recruitment and Retention Policies. World Bank, Washington, DC. Vujici Marko, and Pascal Zurn. 2006. “The Dynamics of Health Labor Market.” International Journal of Health Planning and Management 21 (2): 101–15. Wanyu, B. . “Birth A endants Trained in Prevention of Mother-to-Child HIV Transmission Provide Care in Rural Cameroon, Africa.” Journal of Midwifery and Women’s Health 52 (4). Wibulpolprasert, Suwit. 2003a. “Inequitable Distribution of Doctors: Can It Be Solved?” Human Resources Development Journal 3 (1): 2–22. ———. 2003b. “Integrated Strategies to Tackle the Inequitable Distribution of Doctors in Thailand: Four Decades of Experience.” Human Resources for Health I: 12. World Bank. 2003. Benin: Pour une plus grande eﬃcacité de la dépense publique: Examen de trois secteurs clés. Report 29656-BEN, December 20. WHO (World Health Organization). 2006. The World Health Report 2006: Working Together for Health. Geneva: WHO. ———. 2008. Task Shi ing: Rational Redistribution of Tasks among Health Workforce Teams: Global Recommendations and Guidelines. Geneva: WHO. 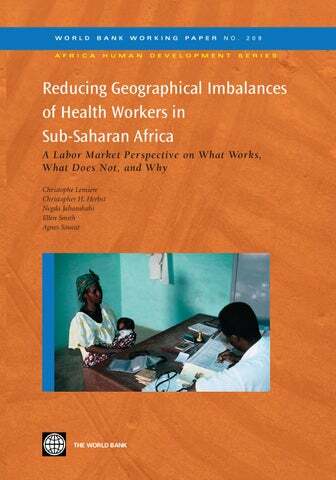 Reducing Geographical Imbalances of Health Workers in Sub-Saharan Africa is part of the World Bank Working Paper series. These papers are published to communicate the results of the Bankâ&#x20AC;&#x2122;s ongoing research and to stimulate public discussion. This paper discusses and analyzes labor market dynamics in Sub-Saharan Africa and outcomes (including unemployment, worker shortages, and urban-rural imbalances of categories of health workers) from a labor economics perspective. This analysis reviews the experience of many Sub-Saharan African countries and is the basis for elaborating policy options that incorporate the underlying labor market forces to address undesirable outcomes such as the urban-rural imbalance more effectively. The conclusions are relevant to researchers, policy analysts, and policy makers with an interest in understanding and improving the allocation of human resources for health in the developing world. This working paper was produced as part of the World Bankâ&#x20AC;&#x2122;s Africa Region Health Systems for Outcomes (HSO) Program. The Program, funded by the World Bank, the Government of Norway, the Government of the United Kingdom and the Global Alliance for Vaccines and Immunization (GAVI), focuses on strengthening health systems in Africa to reach the poor and achieve tangible results related to Health, Nutrition and Population. The main pillars and focus of the program center on knowledge and capacity building related to Human Resources for Health, Health Financing, Pharmaceuticals, Governance and Service Delivery, and Infrastructure and ICT. More information as well as all the products produced under the HSO program can be found online at www.worldbank.org/hso. World Bank Working Papers are available individually or on standing order. 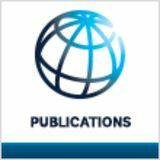 The World Bank Working Papers series is also available online through the World Bank e-library (www.worldbank.org/elibrary).